Learn Italian the Easy Way — Just Listen! Italian is the official language of Italy and San Marino, and an official language of Switzerland, Croatia, and Slovenia. It is spoken by about 58 million in Italy, 24,000 in San Marino, 840,000 in Switzerland, another million in other European countries, and 5 million in North and South America. You’ll be speaking and understanding in no time flat! Italian I, Comprehensive includes 15 hours of spoken language practice and one hour of reading instruction in thirty, 30-minute lessons. 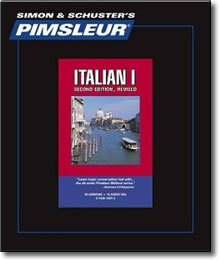 Reading Lessons are included and start at Unit 9 to provide you with an introduction to reading Italian. These lessons, which total about one hour, are designed to teach you to sound out words with correct pronunciation and accent. A Reading Booklet to be used with the audio lessons is also included in PDF format. CD Version Includes: 30 Audio Lessons (Lessons 1-30) on 16 Audio CDs / User’s Manual / Reading Booklet / Carrying Case.